When the parents of a child are separated, getting divorced or otherwise do not live together, arrangements for custody need to be made. This can be an upsetting and contentious process. Parents fear that they may see their child less than they want and may lose control over decisions such as where the child goes to school. Children are also fearful, and vulnerable, in such situations. Ultimately, the child's mental and physical well being are the court's primary concern when deciding custody arrangements, and therefore any extenuating circumstances that affect the child will be taken into consideration. While some parents work out their own custody arrangements, the assistance of a family law attorney is helpful no matter what the situation. A family lawyer can help you understand the child custody laws in your state and help ensure that your rights and wishes are adequately reflected in the custody arrangement. If, during the separation or divorce process, you are unable to reach a custody agreement (also known as a parenting agreement) with the other parent of your child, the courts will step in and impose rules and restrictions. Physical Custody. Physical custody refers to the day-to-day living arrangements of the child. If the child lives primarily with one parent, that parent has sole physical custody. If the child will be spending a significant amount of time with both parents, they have joint physical custody. Legal Custody. Legal custody concerns the right and obligation of a parent to make major decisions for his or her child. Even if one parent is awarded sole physical custody, courts normally favor joint legal custody unless there are extenuating circumstances. Sole Custody. Sole custody means one parent exclusively takes care of the child and makes the major decisions for the child. Joint Custody. Parents may have joint physical custody, joint legal custody or both. Joint custody is the most effective way of maintaining parental involvement following a split and preserving the parental status of both the mother and the father. Joint custody agreements may require mediation to settle disagreements between parents. Temporary Custody. An interim arrangement typically put in place during the course of a separation or divorce proceeding. Third Party Custody. When both parents are unable to properly care for their child, the court may award custody to a third party such as a grandparent or other relative. Divided or Alternating Custody. Allows parents to have custody for alternating blocks of time (even a year or two at a time). The non-custodial parent has visitation rights when the child is not with him or her. Split Custody. When one or more siblings live with one parent and the remaining sibling(s) live with the other parent. This is rarely ordered by the court, as splitting siblings is generally not considered in their best interest. Rather, instances of split custody usually evolve informally among older children. Birds Nest Custody. A special form of joint custody where the child stays in the family home and the parents take turns moving in and out of the house. To protect your rights and gain a better understanding of the various types of custody arrangements, it is important that you contact a qualified family lawyer as soon as possible. How Are Custody and Visitation Determined? Courts award custody based on the "best interests of the child." In the past, courts were more likely to grant custody to mothers. This has changed in recent years. By law, no longer is the mother the presumptive custodian. Instead, both parents begin on equal footing. 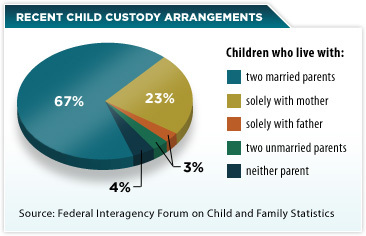 Increasingly, courts are more inclined to view joint custody as the best situation for the child. Can the Custodial Parent Move? The custodial parent cannot just pick up and move your child away. This is true even if he or she has a very good reason such as better schooling for the child. Because the courts place a high premium on the non-custodial parent's relationship with the child, many states require permission of the parent or the court before the custodial parent can make a move. A family law attorney can evaluate your situation and help you determine your legal rights, as well as those of your child. Many different facts and circumstances are taken into account in a child custody case. Typically, the wishes of the parents, children and other important parties, including siblings, are considered. Mental and physical health and well-being is also a factor. The child's home, school and community life may also play an important role. Non-marital intimate relationships and other lifestyle choices can sway a judge if he or she feels it is upsetting or harmful to the child. (The more discreet the behavior the less likely it will be a factor.) Finally, courts advocate fostering a good relationship between the child and the other parent. A parent who is unlikely to encourage a positive relationship between the child and the other parent may damage their standing with the court, particularly with regard to custody issues. A non-custodial parent is entitled to "reasonable visitation" with the child, including overnights and vacation. If the parents are unable to work out a visitation schedule on their own, the family law courts will set one. If the custodial parent habitually interferes with the non-custodial parent's visitation rights, the courts may consider giving custody to the other parent. To that point, the custodial parent may not withhold visitation even if the non-custodial parent is failing to pay child support. On the other hand, a non-custodial parent who is unreliable and inconsistent with respect to his or her visitation rights may lose those rights. Likewise, if the non-custodial parent has a history of substance abuse or violence, the court may order visits to be supervised or even suspended if that is in the best interests of the child. Prior or current incarceration does not necessarily restrict visitation. An experienced family law or divorce attorney can evaluate your unique facts and circumstances and help fight for a desirable custody agreement. The Federal Parent Locator Service is available through state child support enforcement programs to locate a child whose whereabouts have been hidden in violation of a custody or visitation order. An unmarried father has the right to request genetic testing in order to prove that he is the father and establish the legal right to a relationship with his child.